Liza Hinman is the Chef and Owner of The Spinster Sisters, and a part of the Sonoma County restaurant community since 2004. Chef Hinman got her start in restaurants during her summers in college- sparking her interest in all things culinary. Upon graduating Middlebury College, Liza took a job as a member of the editorial staff of Gourmet Magazine, working directly for the Executive Food Editor. This job launched her into the culinary world, and after decided she wanted amore hands-ion role, she departed in 2001 to attend the California Culinary Academy in San Francisco. Woodward’s Garden, Loretta Keller of Bizou and Craig Stoll of Delfina. In 2005, she migrated north to Sonoma County- and began work at the renowned Santi Restaurant in Geyserville, under Chefs Franco Dunn and Dino Bugica. In 2009, Chef Hinman assumed the role of Executive Chef of Santi, delving deeply into the traditional world of Italian cuisine. In 2010, she designed and oversaw the move to a new location in Santa Rosa, and earned a glowing review from the San Francisco Chronicle upon the restaurant’s re-opening. 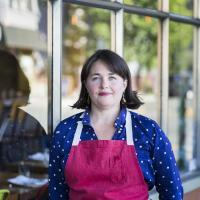 The Spinster Sisters is Chef Hinman’s current project. Located in the SOFA district of Santa Rosa, CA, the restaurant opened in 2012. The menu focuses on “Sonoma County Cuisine” - bringing a fresh example of New American dining to Santa Rosa. Awarded with both local and critical accolades, including the Bohemian’s Best Restaurant in Sonoma County in 2017 and 2018, The Spinster Sisters is now entering its 6th year of operation- and continues to be at the forefront of the dining scene in Sonoma County. In 2017, Liza and the partners in The Spinster Sisters renovated and opened The Astro, a mid-century modern motel located on Santa Rosa Avenue. The Astro embraces the same brand of hospitality established at The Spinster Sisters- with a deep focus on the neighborhoods and experiences of Sonoma County. She is also currently working on developing the “Spinster Pantry”- a line of food products and retail items based on the cuisine of The Spinster Sisters. In 2017, Chef Hinman also completed The James Beard Foundation’s inaugural Women’s Entrepreneurial Leadership Program- bringing a new focus of business development to her role at the company. Chef Hinman is a mother to three young children, and resides with her husband, Joe Stewart of The Downtown Bakery, in Healdsburg, in Northern Sonoma County.